Improvements – Farmland, good access, approx. 2 miles of creek bottom, Good income from farm rent. 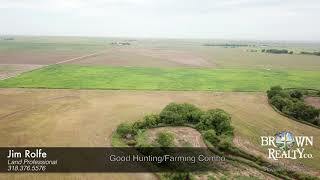 Comments – This fine Comanche Co., KS combination cropland & hunting tract. will produce good income along with a nice place to deer hunt. It has approx. 2 miles of creek bottom with good trees for bow-hunting. This area is known for good wing shooting as well, with good pheasant, doves, & quail to hunt. Call for a showing.